Looking for the best curling iron for straight hair? Having straight hair is a blessing in some ways, but it does come with some inconveniences. For one, your hair isn’t as voluminous as others’. In addition, it gets greasier faster than other hair types and goes flat quicker. But the biggest struggle is making curls that last longer than an hour. 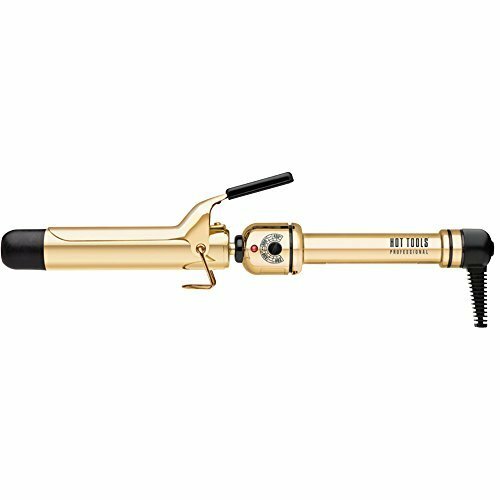 Pro Beauty Tools 24-Hour Curls Professional Extra-Long Gold Curling Iron, 1 1/4"
When it comes to tools for styling your hair, don’t compromise on quality. You need to select the best curling iron for your particular hair type, not based on how well it works for someone else. Using a high-quality iron will give you damage-free, long-lasting curls. Without applying heat to your hair, it’s extremely difficult to create curls or waves on fine, silky, or straight hair. This hair type is also more susceptible to damage from heat. For this reason, it’s best to find a gold curling iron as these tend to heat more evenly and be of higher quality. These are the types of irons used by salon professionals and it’s for a good reason. 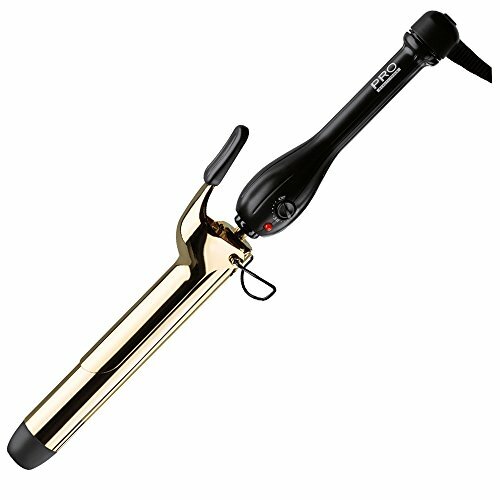 If you are set on a curling iron that will give you long-lasting waves, this Gold Curling Iron 1-1/4” by Pro Beauty Tools is a good choice. Specifically crafted to create 24-hour curls, this iron gets hot enough to give even the straightest hair beautiful waves. You can adjust the temperature if you prefer lower heats and the on/off button won’t get in the way while you’re curling your hair. If you’ve ever accidentally turned off an iron while in the middle of getting ready, you will appreciate this feature. 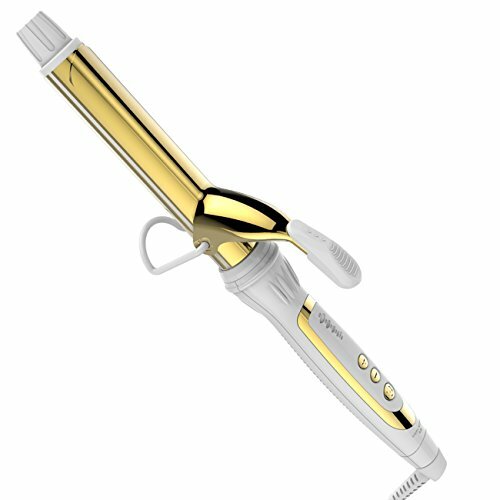 The gold plating on this curling iron makes your finished style nice and smooth and reduces frizz. The cord swivels so it doesn’t tangle as you use the iron. And perhaps best of all, the price is affordable. To some people, a curling iron with a comfortable shape is a must. If you are one of these people, the Hot Tools All Gold 1.25 iron is worth thinking about. It has adjustable heat and looks great with an ergonomic shape. This is important if you have very long or thick hair that takes ages to curl. The curling iron has spring replacements as breaking springs aren’t uncommon when you own the same curling iron for a while. This iron has a beautiful design and feels very luxurious. But keep in mind that it’s best for larger waves or curls. For those who have short hair or want smaller curls, a smaller barrel will be necessary. For those who prefer heated styling tools with a ceramic-plated iron, the Anjou 1.25 inch Iron is a great candidate. It has an anti-scalding tip that won’t damage your hair and a very affordable price. The iron heats up quickly just like high-end salon irons and you can adjust the temperature by 10-degree increments. The tip is cool and the tool comes with a swivel cord. As most people with long hair know, it can be difficult to find the right tool that can handle a lot of hair. Hunting for the best curling iron, in general, can be time-consuming, but buying this one will cut out all that work. The design is best if you have medium or long hair, but it will also work for shorter hair. This is due to the barrel, which is longer than average. The iron grips your locks tight enough not to slip but won’t leave any creases as other irons do. It comes with a voltage that is usable in both the US and Europe, so this is great for people who tend to travel a lot. The product also comes with a heat glove. Another golden tool on our quest to find the best curling iron, the DSHOW Pro Nano Gold heats up evenly and quickly. For those who have been needing a new tool to replace their old curling iron, this one is a great candidate. Many of us have limited time to get ready in the morning which is another useful feature of this tool. It’s good for using while you’re in a hurry as it doesn’t take long to create curls, even in stubborn straight hair. It’s a well-made styling tool, works in seconds, and saves a lot of time overall. This brand is well-rated and reliable. The curling iron comes with a shut-off button so you don’t have to unplug it between uses. It has a professional look and ceramic coating to keep your hair safe from damage. This is ideal for those who want to create bigger waves or curls. The DSHOW PRO Nano is also great for long hair as it has the extra long barrel. As you might have guessed by the name, this iron is perfect for those who are always on the move. Another curling iron that automatically changes the voltage, the Travel Smart Iron by Conair is another perfect option for straight hair that is hard to curl. It changes voltage automatically whether you’re in Europe or the U.S., all you need is an adaptor. What else makes this iron so great for travelers? It comes with a hand guard so you can pack it away soon after use without waiting for it to cool down. If you need to get ready lightning fast in your hotel room before a flight, this is the best tool to use. 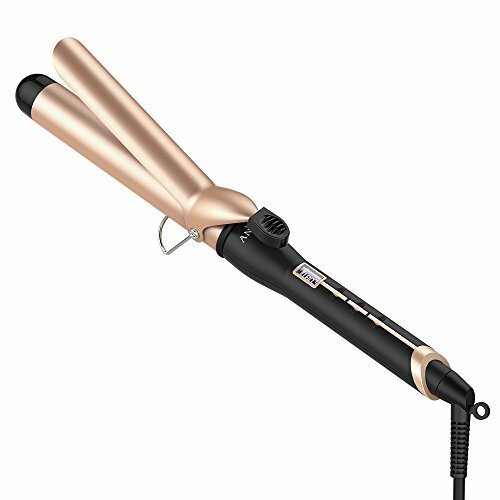 The Travel Smart heats up super fast, creates a long-lasting curl, and is very easy to use for anyone. The design is simple, which some prefer and the value is great for the price. It’s never very fun to buy a complicated tool and have to spend ages getting familiar with it. With this, you can just plug it in and go right after opening the product. Conair is a trusted brand as they provide a variety of long-lasting and reliable products. Now they have something for those seeking the best curling iron for straight hair. Setting spray after using your curling iron will help your waves keep their shape. But how you should do this does depend on the look you’re going for. If you want tighter curls, try spraying it immediately after you use your curling iron. For looser ones, you can shake your head a bit to loosen the curls, then spray. Don’t ever use an iron that has a bigger barrel than the curls you want. If your hair is very silky, fine, or straight, don’t forget to use a size smaller than the look you’re going after. This is because fine hair doesn’t hold a curl as well as other hair types. And don’t forget to use a bigger barrel with small sections of hair and smaller barrels with bigger sections of hair. A great hairstyle starts with the right products. For straight hair, avoid anything that reduces volume or makes your hair greasy. All-natural shampoos are great because they have fewer preservatives and don’t weigh straight hair down as much as commercial products. Once you have selected the best products and best curling iron, make sure you use them at the right times. Hairspray, for instance, should only go on after you curl and never before. This leaves a residue on the iron and can cause damage to your hair. As soon as you’ve completed your style with the best curling iron, resist re-positioning or touching your curls once you’ve already sprayed them. This will help your style last much longer. If you do want to loosen your waves you can shake your head around a bit. With naturally straight hair, this should be quite an easy look to achieve with the right tool.